You will start out on the Red loop. This is one giant loop. You will head from the starting line that is near the bottom of the map. you will head up to the Great Wall, this is section is a paved road with little to no cars. It will have service vehicles and golf cart type vehicles. It is just under 1K to the Great Wall. As you make your way to the Great Wall at the end of the road you’ll hit the main square, this will be Station 1 supply/aid (you’ll pass this several times throughout the course) heading up the stairs you’ll reach the Great Wall Main Gate. you enter through the main gate doors and head up the steps, you’ll be facing the Generals house, this is listed on your map as the Generals house/Tower 1. Once up the entry way steps you’ll turn left and make a u-turn and head out to the West Towers. You’ll run through 6 towers both restored and unrestored. The steps will vary in height from 5 inches to 24 inches. Watch your step entering in W. Tower 1. When reaching Tower 6 you’ll head off the Great Wall and head down through the trails to the Gubeikou Great Wall. (if it’s been raining you’ll want to use caution, it’s a dirt trail and will be muddy.) The DO NOT ENTER SECTION is the military section but there will be parts that you’ll run along side the Wall and through farming fields. It’s a nice trail run, step in some areas. You’ll be able to refuel at station 4 at this point. Once off the trail to Gubeikou Great Wall section, you’ll run for about 23 towers. The towers in the section are in complete ruins and in some areas you’ll need to exit the Wall due to dangers. Some towers and section of the Great Wall will have giant holes so, you might have to do single file at times. There is a water stop at G-Towers 12/13 Station 5, when reaching G-Tower 23 you’ll exit of the Great Wall and head to Station 6. At Station 6 you’ll need to check in and have your bib marked and your bib number recorded. Then head back to the Generals house at Tower 1. Once back at the Generals House/Tower 1 you can exit back down the Wall to the main Square for more aid at Station 1. But you’ll need to get back on the Great Wall. At this time you will continue straight to Tower 25. At Tower 25 you’ll need to check in and have your bib marked. This is the last time you’ll visit Tower 25. Heading back you’ll head to Tower 21 where you will exit the Great Wall and head down to Station 3. At station 3 you will need to check in again and have your bib marked. Take your time refuel and use the bathroom if needed. You are still currently on the red loop. When finished you will head back up to Tower 21 and turn right and head back to the Generals House/Tower 1. At the Generals house, you will head back down to the start. Check in and prepare to start the yellow/golden route. 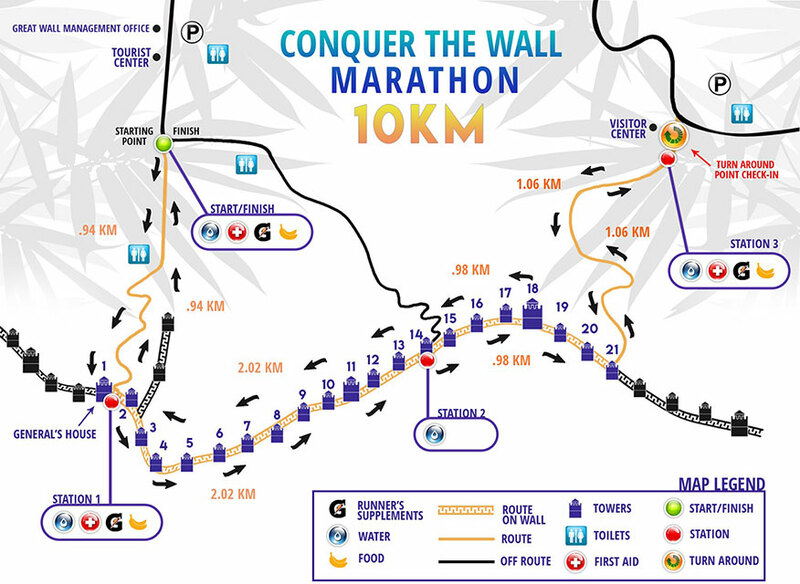 The yellow Golden Route means you have 10k left of your race. You will head back up the paved road to the Generals House/Tower 1. and head back to Tower 21. At Tower 21 you will head down off the Wall again to Station 3 and check in. Your bib must be marked before you head back to the finish line. (please note you will NOT go out to Tower 25 again). Once you have checked in at station 3 you have 5K left. You’ll head back to Tower 21 and then back to the Finish line. The sections from Tower 1- 25 average from restored to unrestored. Each Tower will have different challenges. Tower 1-25 and station 3 will have the most elevations gains. The G Towers do not have much change in elevation. However the trails to reach the G Towers will have elevation gains and losses. You will start out on the Blue loop. This is one giant loop. Once up the entry way steps you’ll turn left and make a u-turn and head out to the West Towers. You’ll run through 6 towers both restored and unrestored. The steps will vary in height from 5 inches to 24 inches. Watch your step entering in W. Tower 1. When reaching Tower 6 you’ll head off the Great Wall and head down through the trails to the Gubeikou Great Wall. (if it’s been raining you’ll want to use caution, it is a dirt trail and will be muddy.) The DO NOT ENTER SECTION is the military section but there will be parts that you’ll run along side the Wall and through farming fields. It’s a nice trail run, step in some areas. You’ll be able to refuel at station 4 at this point. Once back at the Generals House/Tower 1 you can exit back down the Wall to the main Square and head back to the Starting line. You’ll be running in the Jinshanling Great Wall. 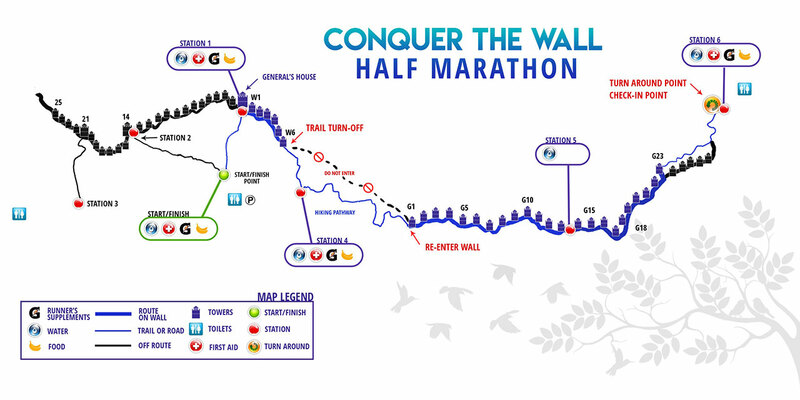 You’ll have 10 hours to complete the race, but we do ask that you don’t stay out on the Great Wall for 10 hours, please finish the race and then you are welcome to head back out to the Wall to cheer on other runners in your group. You will head from the starting line that is near the top of the map. you will head up to the Great Wall, this is section is a paved road with little to no cars. It will have service vehicles and golf cart type vehicles. It is just under 1K to the Great Wall. As you make your way to the Great Wall at the end of the road you’ll hit the main square, this will be Station 1 supply/aid (you’ll pass this twice on the course, as you head to the Great Wall and as you leave the Great Wall.) heading up the stairs you’ll reach the Great Wall Main Gate. you enter through the main gate doors and head up the steps, you’ll be facing the Generals house, this is listed on your map as the Generals house/Tower 1. As you reach the top of the stairs you’ll head straight around the Generals House. (a quick right turn will get you around the building) There will be a volunteer here to point you in the right direction. You’ll continue straight until Tower 21, where you will exit the Great Wall and head down to Station 3. You must check in at station 3 and have your bib marked. When reaching Tower 18 you will need to check in before heading back to the finish line. 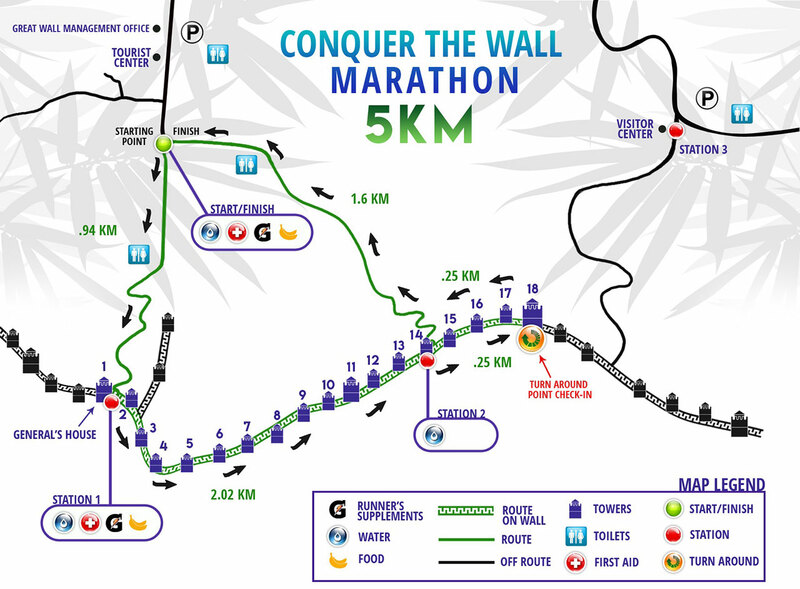 Between Tower 13 and 14, you will exit the Wall and head back down to the Start/Finish line on with walking path. There will be someone there to point you in the right direction. A water station will also be in this area. Though you are running a short distance we highly recommend a using a hydration pack, you’ll have limited water stops on the Great Wall. 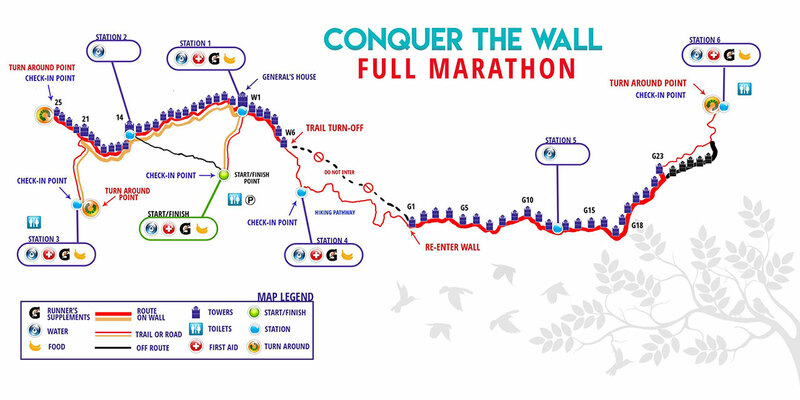 Overall the Great Wall of China running course varies in height by around 200m (about 650feet) between the start line and the highest point at East Tower 20. Stone guard towers are spread along the length of the wall, each some 200m to 300m apart. Stone steps and walkways, following the up and down contours of the ground, connect the towers. The effect this creates for runners is similar to interval training, with an effort required to climb up, followed by a recovery period coming down. Regular training on steps as part of your preparations for the Great Wall is highly recommended.